WASHINGTON -- Auto safety regulators, for the second time late Tuesday, expanded their warning to owners of vehicles recalled for defective Takata airbags, urging them to get the airbags replaced. But the federal website created to help consumers to verify whether their vehicle has been recalled was unavailable for most of the day, and was still down as of Wednesday afternoon. After initially directing consumers to keep checking that website in its first alert to consumers on Monday, the National Highway Safety Traffic Administration is now instructing customers to visit vehicle manufacturer websites to verify whether their car has been recalled. Meanwhile, The Wall Street Journal, citing people familiar with the matter, reported today that federal prosecutors led by the U.S. Attorney's Office in New York are investigating Takata's handling of the defective airbags. The newspaper said the probe is at a "preliminary stage," and that prosecutors don't want to down the recall efforts. There was no immediate comment from Takata on the report. The Takata probe is patterned after another investigation by the Manhattan U.S. attorney that eventually led Toyota in March to pay $1.2 billion to settle fraud charges that stemmed from its unintended acceleration recall crisis, the newspaper said, citing one person briefed on the matter. The latest alert from NHTSA said as many as 7.8 million U.S. vehicles are affected by the recalls for potentially defective Takata Corp. airbags that could spray shrapnel at occupants after a crash. That’s up 28 percent from the 6.1 million announced hours earlier. NHTSA said the new number corrected the vehicle list provided in prior safety bulletins this week, adding some vehicles and excluding others from previous bulletins. NHTSA has urged owners of certain Toyota, Honda, Mazda, BMW, Nissan, Mitsubishi, Subaru, Chrysler, Ford and General Motors vehicles to replace installed air bags as soon as possible. NHTSA is focusing its most urgent warnings on owners affected by regional recalls of vehicles sold or registered in areas of Texas, Alabama, Mississippi, Georgia and Louisiana near the Gulf of Mexico, as well as Florida, Puerto Rico, Guam, Saipan, American Samoa, Virgin Islands and Hawaii. “Responding to these recalls, whether old or new, is essential to personal safety and it will help aid our ongoing investigation into Takata airbags and what appears to be a problem related to extended exposure to consistently high humidity and temperatures,” David Friedman, NHTSA deputy administrator, said in statement. The U.S. safety agency is investigating whether Takata airbag inflators made between 2000 and 2007 were improperly sealed. Bags inflating with too much force could potentially spray metal shrapnel at occupants. They have been linked to four deaths and resulted in several lawsuits. The probe has focused on inflators recovered from cars being recalled for repairs in hot and humid places like Florida. 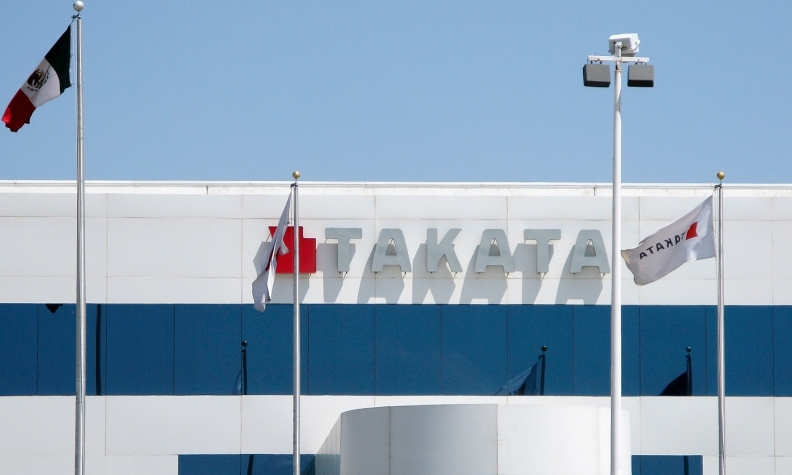 Takata is cooperating with that investigation along with 10 automakers. GM said Tuesday it plans to warn owners of 2003-04 Pontiac Vibe hatchbacks in warm-weather areas not to allow front-seat passengers until defective air bags are replaced. The overnight letters will go out “as soon as possible” and the Vibe owner group may grow, GM spokesman Alan Adler said. GM and Toyota jointly built the Vibe at a factory in California that’s now owned by Tesla Motors Inc.
“We are treating this urgently,” Adler said. Of the 85,000 people who own these cars, those living in high-humidity areas, including South Florida, Puerto Rico, Hawaii and Guam, will receive the letters. GM doesn’t yet have a precise tally of owners in those climates, Adler said. In its statement Tuesday, NHTSA also encouraged owners of the 2005 Pontiac Vibe and 2005 Saab 9-2X to have their vehicles checked and recalled if necessary. The agency encouraged owners to periodically monitor the agency's online database, using a vehicle identification number, to determine whether a model is subject to recall because automakers continue to add vehicles to the recall list. Takata said it would cooperate fully with U.S. authorities and automakers after NHTSA issued the latest advisory. "We take (the NHTSA's) latest action seriously," Takata said in a statement. Takata said the cost of repairs for the 4.74 million vehicles subject to NHTSA's bulletin on Monday had already been set aside, and that any additional costs would be minimal. The deepening crisis involving deadly airbags is shaking confidence in the ability of automakers including Toyota Motor Corp. and Honda Motor Co. to ensure the safety of millions of U.S. drivers. Toyota is advising U.S. owners to keep passengers out of front seats until defective Takata airbag parts are replaced, four months after following the same procedure in Japan. Takata faces investigations into whether exploding shrapnel from its flawed parts are to blame for at least four deaths involving vehicles made by Honda, including a Florida crash that was initially investigated as a homicide because of deep gashes to the victim’s neck. The growing number of airbag recalls also raise doubts about whether carmakers have learned to address defects quickly and comprehensively after GM's bungled ignition switch recalls and Toyota’s failures in 2009 and 2010 involving unintended acceleration. Honda is under separate probes over whether it underreported fatalities and injuries in the U.S. The recalls of at least 4.7 million vehicles in the U.S. during the last two years tied to Takata airbags also involves Nissan Motor Corp., Mazda Motor Corp., and BMW. The U.S. House Energy and Commerce Committee said on Tuesday it was seeking information about Takata's airbag defects from the NHTSA and automakers. The U.S. House Energy and Commerce Committee asked federal safety regulators to provide a briefing on its investigation into the airbags manufactured by Takata, a House committee aide said on Tuesday. The aide also said that committee staffers plan to meet with auto manufacturers "to discuss supplier issues." The committee wants to hear directly from NHTSA about its probe into Takata, the aide added. U.S. Sen. Bill Nelson, D-Fla., where some of the airbag incidents have occurred, wrote to NHTSA Deputy Administrator David Friedman urging the agency to further expand the recalls. "NHTSA should ensure that owners of cars that are not registered in Florida, but spend a substantial portion of the year operating in the state of Florida are covered by the recall," Nelson wrote. He was referring to "snowbirds," people who spend winters in Florida to escape the cold in the northern part of the United States. In his letter to Friedman, Nelson also said automakers with defective airbags should offer loaner cars or rental car reimbursements for consumers unable to get their cars fixed quickly. Toyota extended a warning to include the U.S. after Takata shared data that showed the inflators sent back to the supplier as part of its customers’ recalls were performing improperly. The world’s largest automaker this week called back 247,000 vehicles, including some models of the Toyota Corolla, Matrix, Sequoia and Tundra, made from 2001 to 2004. NHTSA issued a statement Monday telling owners to “act immediately on recall notices to replace defective Takata airbags,” adding there should be particular urgency in areas of high humidity such as Florida, Hawaii, Puerto Rico and the Virgin Islands. Honda is still examining airbag inflators that have been replaced as part of its recalls of 2.8 million vehicles in the U.S. tied to Takata airbags the past two years, spokesman Chris Martin said. “We will act appropriately based on the results of this investigation,” Martin said by phone. Honda is Takata’s biggest customer and has called back 6 million vehicles for problems with airbags in nine recalls since 2008. The carmaker owns 1.2 percent of Tokyo-based Takata. Nissan doesn’t plan to disable passenger-side airbags in the U.S. and hasn’t received instructions from NHTSA to do so, said spokesman Chris Keeffe. Mazda also doesn’t plan to change its U.S. recall strategy, spokeswoman Keiko Yano said by phone. Motorists wondering whether their cars are subject to a recall can type their vehicle identification numbers into the government’s website, www.safercar.gov. The search function on the site was not working for much of the day and evening Tuesday. While Takata is at the center of the U.S. government’s airbag investigation, NHTSA also is probing how the car companies responded to defects with the components. The Center for Auto Safety, a watchdog group in the U.S., accused Honda last week of failing to report all airbag-related injuries and a deaths to a government database as required. The center’s Oct. 15 letter to David Friedman, NHTSA’s deputy administrator, also called for the U.S. Justice Department to conduct a criminal investigation into Honda’s reporting. The Florida Highway Patrol said last week it’s investigating a fatality involving a Honda Accord driver stemming from neck wounds allegedly caused by an inflating airbag. There are at least two similar incidents involving Honda vehicles. Honda said Oct. 16 it’s also examining whether a faulty airbag was to blame for the death of a man who crashed his Acura sedan in a California parking lot. Ryan Beene, Reuters and Bloomberg contributed to this report. Owners of the following vehicles are being urged to act immediately on recalls involving potentially defective airbags made by Takata, according to a corrected list distributed late Tuesday by NHTSA.